And shop for holiday meals and gifts. Not that different from what we do in North America around the holidays. But we attend many parties and events here during the the week of Christmas. Â Far more than we did in California. 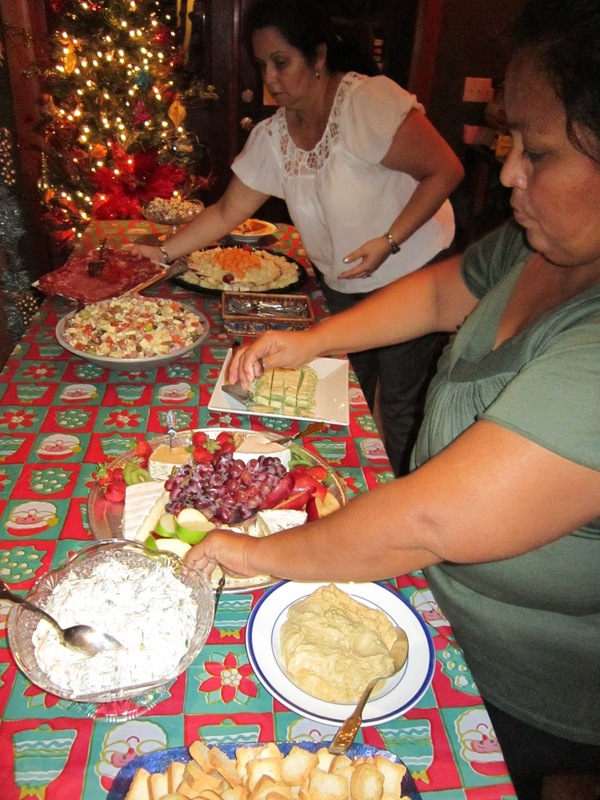 But we chose to stay home and share a quiet dinner with our friends on Christmas Day. 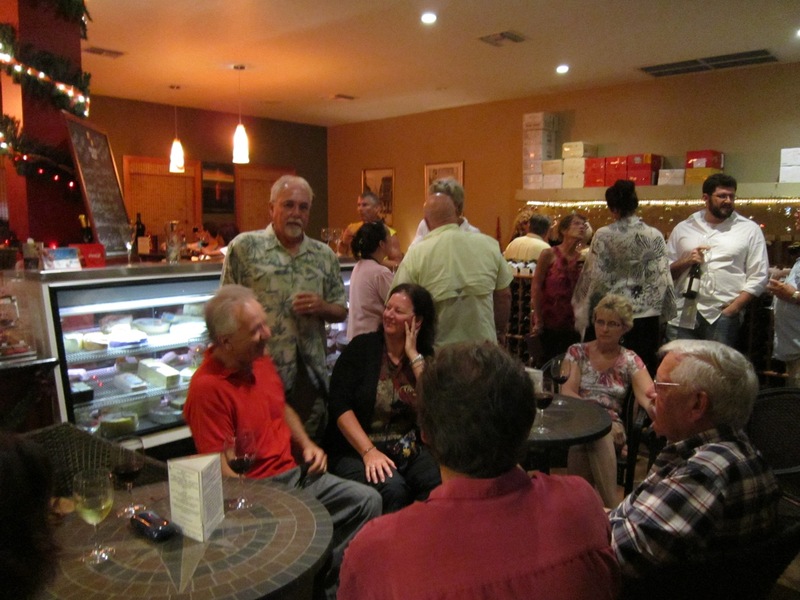 By now you probably know that on Friday nights Mike and I often get together with friends at Wine de Vine.Â We bring many of our Chill Weekend visitors to Wine de Vine. This gives them a chance to meet other expats. They can then hear a variety of perspectives about the island lifestyle. .Â This party was the perfect way to phase into the holiday scene. It was a pleasure to mingle with the expats and Belizeans who have become our friends. Few tourists showed up for this this party, although they are always welcome. You just have to know about it. But several of our Baymen Garden owners did appear. Both Jim Knuff, and Vince and Sharyn Cerniglia joined us at the party. Jim lives here fulltime now. Vince and Sharyn often visit. Several other past Grand Baymen visitors also dropped in. They learned during a past Chill WeekendÂ or conference event that this is a comfortable place to mingle. fleecy clouds breezed by. My eagle eye friend Janice pointed out a pink flamingo as it few towards the Back Bay. The water was ÂcrispÂ, but comfy. .. So our little group of die hard attendees started the day the right way. Our reward Â the plate of homemade Christmas cookies we shared afterwards. But we did attend the best known Christmas Eve Party on this island. Each year Lord Barry Bowen, and Lady Dixie Bowen have thrown a Christmas Eve party that's family oriented. Dixie is the wife of the now "late" Lord Barry Bowen. 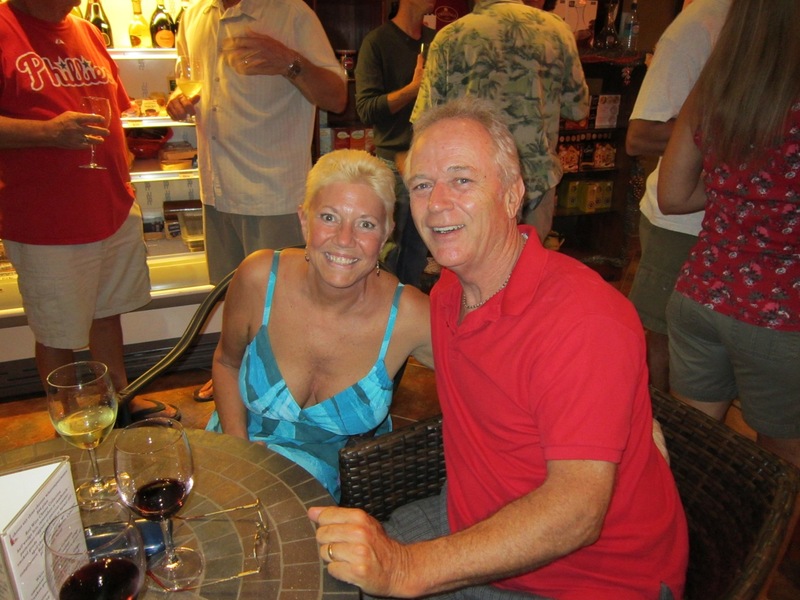 Barry was the owner of Belikin Beer and many other companies in Belize. He is considered to be the richest man in Belize. But in February of 2009 he met with an unfortunate early demise while piloting his own plane. This Christmas Eve party is community oriented. The Bowens provide the venue, liquid refreshments, Christmas tree, Santa and gifts. Each visitor brings a nice appetizer or main dish. Then everyone shares in the colorful Christmas potluck. Attendees are a mix of San Pedranos and expats, as well as Island Academy staff and parents of school children who attend this quality Academy. The spot is perfect for a party, since it's right on the beach. The grounds are open and spaceous enough for Santa to drive right up to the outdoor Christmas tree in his jazzyÂ golf cart. 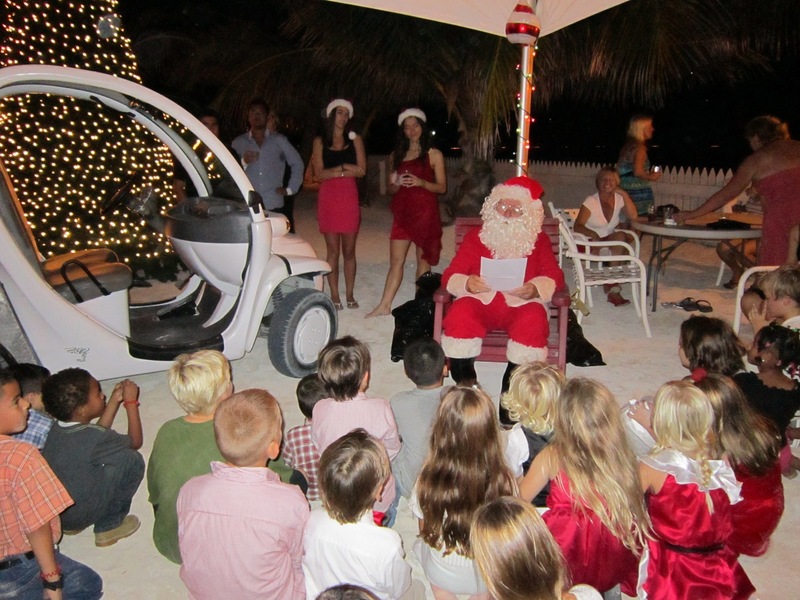 Where else but on Ambergris Caye would this happen? 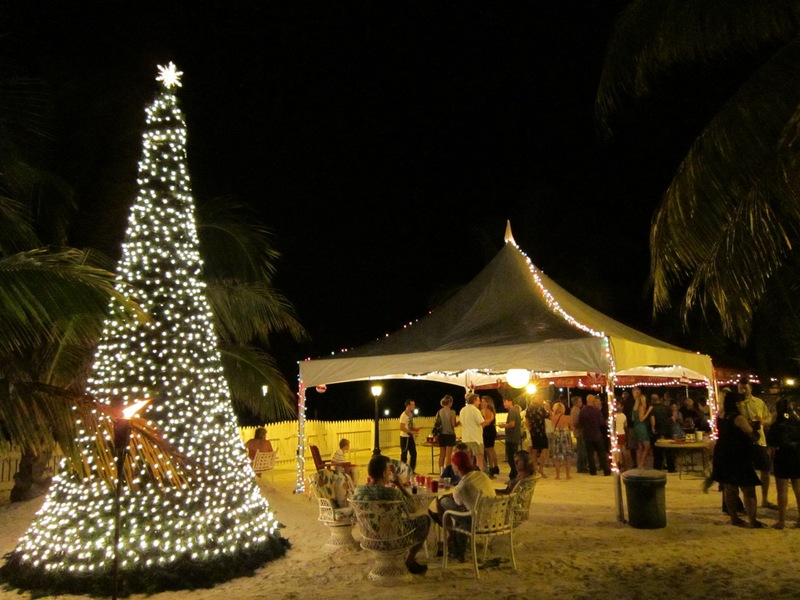 Many expats walk the beach on Christmas morning and then head to a local restaurant for a special Christmas dinner. Or they may head to the Living Word Church, for a lively services. The weather was perfect, the water calm. Some friends gathered at a big Bonfire Christmas Party, on the south side of the island. Others attended the usually raucous Christmas Day Party at Pedro's Inn. There were certainly plenty of options on Christmas Day.